I was never interested in Jdorama until the very first show I watched by accident at a friend's place and I was totally bowled over by the professioalism and depth of Matsu Takako--that first show was Love Generation and she was just 19 when it was filmed. I have since learnt that she is known as "the Queen of soap operas" in Japan and if you watch her shows, you'll undertand why. Most guys like me may find her attractive but this was not what captivated me. Rather, Matsu is one of those rare actors / actresses who truly "belong" on screen, like a Vivian Leigh, Rita Hayworth or Liz Taylor. I admire her because of her professioalism, and if you watch her shows carefully, you will notice she makes the most of every shot and evey emotion, nothing is half hearted--which is rare on TV. Having watched all her shows I can tell you that she cries in every single one because she is among very few who actually cries real tears on TV and it is said she could cry in 3 seconds flat. I also admire her as a true artist--not only can she sing very very well (over 30 singles and albums plus 2 round Japan concerts), but she acts in many plays in Japan, composes a few of her songs, writes many of the lyrics, plays the piano like Elton John but surprisingly has acted in only 5 feature films so far although she did win the Japanese Oscar (equivalent) in her last film--the Hidden Blade released in 2004. She has won so many acting and singing awards, and is constantly featured in ads--both prints and on TV. However, her abilities are not too surprising once you realise that her father is a famous stage actor and Matsu was trained for the stage from a very age. All her siblings, one brother and one sister are involved either on screen or on stage but not as famous as Matsu--truly a rare phenonmenon who has given me many hours of viewing pleasure. her looks are to be envied. her acting is great. she has natural beauty that's both kirei and kawaii. she's so flexible in her acting. she's a convincing outspoken tomboy in Hero. she's a convincing quiet, demure female in Long Vacation. That's what i consider range. FURTHERmore, she's got a pretty singing voice. Having watched Matsu in Love Generation, Long Vacation, Hero (& SP), Uchouten Hoteru and Itsumo futari de, I've come to see why she's such a great actress. Her natural beauty and strong acting skills are definitely to be commended. Definitely looking forward to seeing more of her dramas. 2nd artist I started to adore when she act in Long Vacation N of coz 100% totally in LOVE GENERATION. first of all... she has wonderful cemistry with kimutaku.. but aside from that her acting is sooo cute but still amazing.. Hero and Love Generation are some of my fav dramas and she played well as both different yet similar characters... obviously knows how to act and be herself! Do I need to write some reasons for voting Matsu Takako? Everyone knows she is a great actress. She has kpet a steady pace growing her acting. I just wonder if there is a limit of her acting. Maybe she should try to challenge the performance as a movie actress. Takako and Takuya are often called the 'golden pairing' in the Japanese drama industry, and it's easy to see why. Takako is a great actress and when paired with Takuya in a drama, the ratings are sure to go through the roof. I like most of her dramas. I think she is a wonderful actress and a pretty good singer. She has the perfect girl next door look and is elegant! she's awesome! and so far, the drama itsumo futari de is awesome and she's one of the main reasons! Awesomest actress ever. ^_^ Her characters are different, but she brings them to life. They're not perfect cutesey girls, but she brings their humanity to light in a way that makes you love them despite their flaws. takako matsu and takuya kimura, what an awesome pair! they look good together, though they can get a little shy. it is really due to the both of them that got me hooked into the wonderful world of japanese dramas! 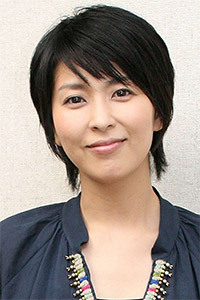 her voice juz like an angel..so clear and smooth..
her acting is also good..^^ luv Matsu forever!! oh well.. i love Takuya Kimura sooo much..and she acted so many shows with him..so i'm getting to like her acting too.. she has very cute character in any dorama she acts.. moreover,she's pretty! Her acting is soooo great and she is always kawaiii in a boyish way, :). Her latest show Itsumo Futari de is a must-see, the best love show since Long Vacation. Gambaru, Takako chan! I like her a lot in Love Generation. Her acting and her expressions show real emotions. She and Kimura Takuya had a lot of chemistry and I love to see them both together in doramas! She is a very cute girl... talented and can sing well too... she is an all-rounder! She can act in any role given to her and act it very well too! I take my hat off to her!!! One of the first few actresses I liked. Cute and all. Think she should try out more roles instead of always playing ditzy characters. Still, she attracts me in some ways. She peforms the best in all her dramas. Has the best chemistry with Kimutaku in Love Generation, Hero and other dramas (aka. the golden couple). And she sings well too. She..is the princess....hehe.....anyway..her face is really natural-simple person...She really great...neither her hair is short or long..but still beautiful la!! a very cute and beautiful actress who plays her role well in many jap dramas... it's a joy to watch her perform alongside cool male leads like takuya kimura!